This report will inform you about all the visitors who had to wait before entering chat. You should aim to have these numbers as low as possible since nobody likes to wait to get their question answered. 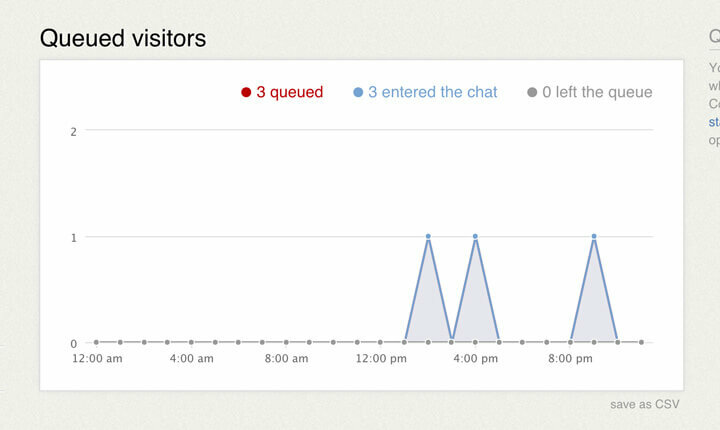 The report shows you how many visitors entered your chat queue. The report also gives you information about the number of people who eventually entered chat and those that left the queue before starting a conversation. You can expect higher leave rates the longer it takes to enter a chat from your queue. You can learn more about the waiting times from the next repot, queue waiting time. 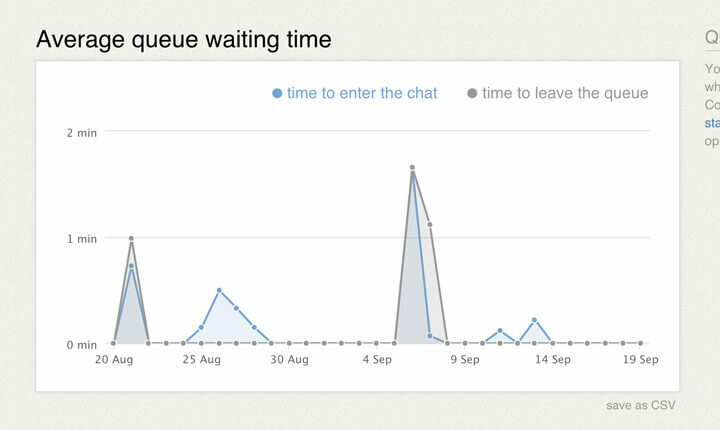 This metric shows both how long somebody had to wait before entering chat and how long it took somebody to leave the queue without a chat. Try adjusting your case resolution time to keep the “entry” time lower than the “leave” time. The clock is started as soon as a visitor enters your chat queue. This final queue-related report helps you reach out to visitors who entered your queue but did not enter chat. All the contact information those visitors left when entering your chat are available in the report. You should contact those visitors as soon as possible to avoid leaving them with a bad experience. You can pinpoint the times when your live chat is getting flooded with too many enquiries by enabling the 24-hour distribution view. You will be able to see when you are getting the most enquiries so that you can assign more agents to those parts of the day.